The ScrapTiffany challenge this week was to use up scraps. 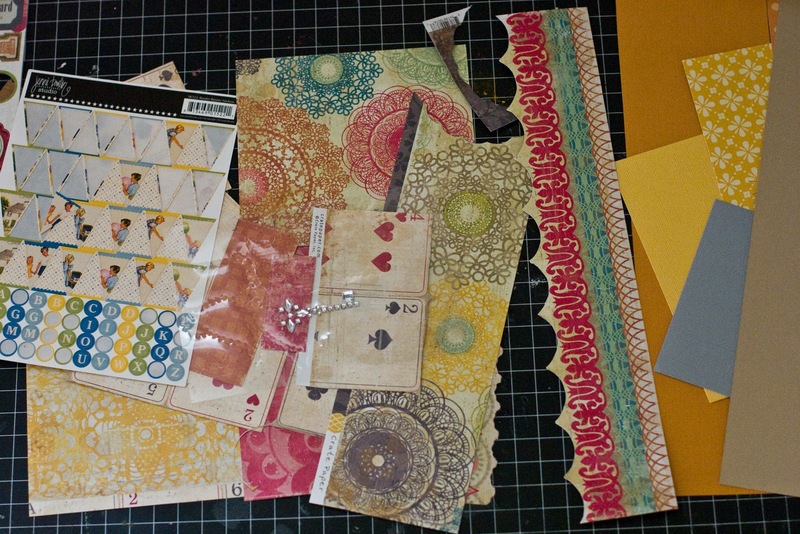 Since I had just done a ton of projects from the 3 Scrappy Boys September add on kit, all I had left were scraps. All the paper except for the Kraft base is a scrap leftover from previous projects! Yay! I love using up scraps rather than finding them piling up in the playroom lol! 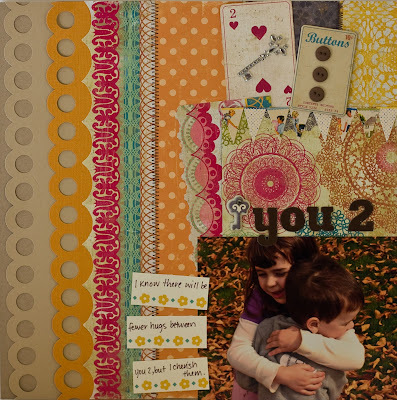 I loved using scraps so much that I did it again on this layout. American Crafts is another company whose scraps I hoard ;) The fabric paper and the chikadees were piled in with my full sheets of AC paper. Before I go I have to share some fun news. 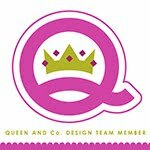 I got an email yesterday requesting a layout I submitted for publication in Scrapbook Trends magazine!! You could've knocked me over with a feather I was so shocked. My first thought was WAHOOOO. My second thought was uhoh, Little Miss is going to be SO jealous because the layout is of Little Man not her!! In any case, the layout will be in the March 2011 Showcase section. 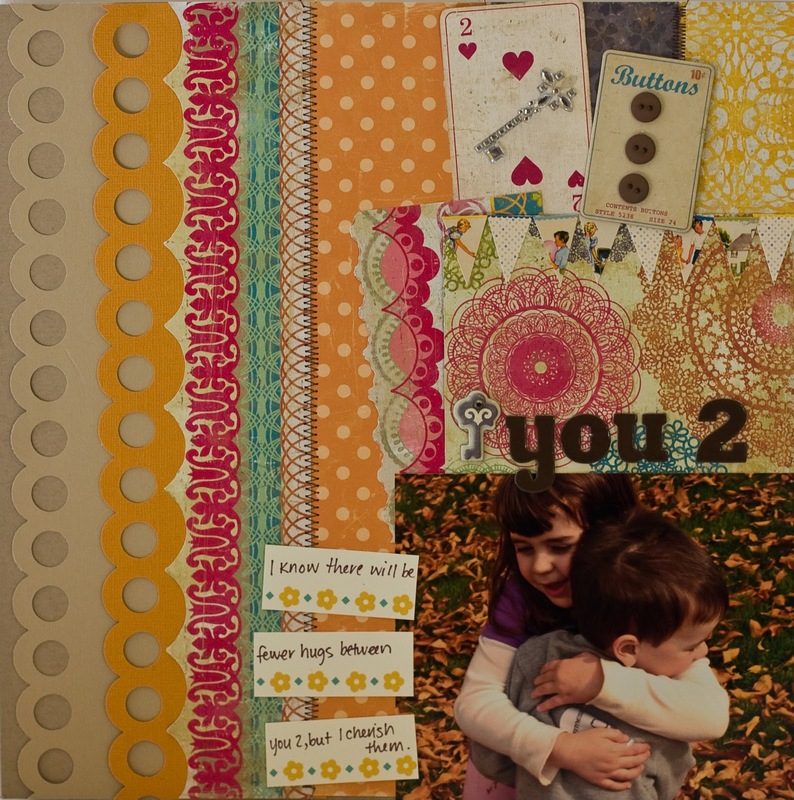 We are going out to dinner tonight to celebrate :) Thanks Scrapbook Trends, you've made this one FABULOUSLY FUN Friday!! Congrats Rebecca, hope you had a lovely dinner. and thanks, thanks thanks i am going to try your first idea, how awesome is that LO. oh my gosh!!! CONGRATS !congrats !! félicitations as we say over here!!! you can be so proud of yourself!! this is so exciting!! and don't worry about your girl! she will understand with time! HOW totally eciting for you for the st pub woot woot I love em both but this second bright pink one is my fav, just totally totally rocking it !!!!! Your ST layout is so cute with the scraps. I love it.